If you choose breast implants for reconstruction, it’s important to know that they don’t always last forever. Plastic surgeon Graham Schwarz, MD, explains. As a breast cancer survivor, you may think of breast reconstructive surgery as a once-in-a-lifetime experience. However, if you choose breast implants for reconstruction, it’s important to know that they don’t always last forever. The time may come when you need to consider replacement or maintenance of your implants. While implant reconstruction offers a safe, straightforward and effective way to restore breast contour after mastectomy, it’s possible to have trouble with your implants years later, says plastic surgeon Graham Schwarz, MD, who specializes in breast reconstruction for cancer patients. There are three main reasons why you might need repair or replacement of your breast implant, Dr. Schwarz says. Most woman will not experience a leak or rupture of a breast implant in the first 10 years following breast reconstruction, Dr. Schwarz says. However, if this should happen soon after reconstruction or any other time, the good news is that there are a number of options to fix the problem. “Typically, we recommend changing the damaged implant or converting to an alternative type of reconstruction based on a person’s preferences, goals and health,” he says. You should be checked by your provider yearly to follow your breast health and to monitor for signs of implant damage. The U.S. Food & Drug Administration currently recommends that women with silicone implants have MRI scans beginning at three years and every two years thereafter. 2. Scar tissue may shift an implant or cause discomfort. Scar tissue can build up and thicken around an implant over time. This occurs more frequently after radiation treatment. Too much scar tissue may create discomfort, making your implant feel tight. It also may pull an implant up high on your chest or make your breasts appear asymmetric. 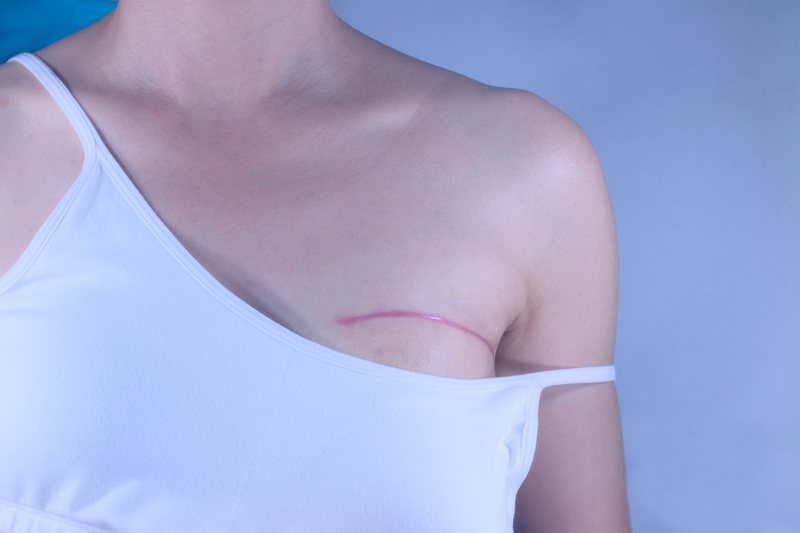 Additional surgery to remove or adjust the scar tissue may help to alleviate the discomfort and improve cosmetic appearance, Dr. Schwarz says. 3. Anatomy changes, loosening skin and muscle contraction may make an implant shift. Your skin and support tissues lose their elasticity over time. These changes make it easier for gravity to pull the breast downward, causing drooping and sometimes increase asymmetry. “This is especially true in women who have had single-sided reconstruction,” Dr. Schwarz says. Medical treatment side effects and changes in lifestyle may also affect weight. This too can alter the shape and symmetry of breasts after reconstruction. Implants have often been placed underneath the main chest muscle. Some women may experience significant implant movement or discomfort with chest muscle motion. A secondary operation can help reposition breast implants in front of the muscle into to a “pre-pectoral” location. Pinpointing why you’re having problems with your breast implant will help to guide the best solution for you, Dr. Schwarz says. Much depends on whether you had a single or double mastectomy, as well as the shape and volume of your implant. Take time to discuss your concerns and overall goals with your plastic surgeon and consider the pros and cons of a surgical fix before you make your decision.